A project is undertaken to address a requirement for a product, service or result. Project management (PM) is the universally accepted standard for handling initiatives that are temporary, unique and done for a specific purpose. PM engages good practices to support coordination, organization and completion of a transient endeavor from start to finish. PM involves the application of skills, knowledge, tools and techniques. PM involves involves efficiently managing resources (people, processes, and systems) to bring about the successful completion of specific initiatives. Project management involves the application of standards, such as the Project Management Institute's Project Management Body of Knowledge (PMI's PMBOK® Guide), which has been adopted by the industry at large and reviewed by the American National Standards Institute (ANSI). It provides guidance or a framework for project management. 500,000+ individuals have earned certification from PMI and the majority of projects worldwide utilize PMI's standards for project, program and portfolio management in business and government, both for profit and non-profit/not-for-profit. The PMOK® Guide presents practical theory that can be used by almost any industry using project management. It integrates process groups and knowledge areas in a 5x9 matrix. Project management requires customization to meet the needs of the performing organization and frequently involves the integration of supporting methodologies (i.e., PRINCE2), approaches (i.e., AGILE), and/or processes (DMAIC). The PRINCE2 (Projects In Controlled Environments) METHODOLOGY is a formal method that shows you how to run your projects. PRINCE2 was created by a UK government agency and is used extensively within the UK government as the defacto project management standard for its public projects. There are 200,000+ practitioners (who hold a PRINCE2 certificate) worldwide that follow this methodology. It is second in popularity. PRINCE2 encompasses the management, control and organization of a project. It is also used to refer to the training and accreditation of authorized practitioners of the methodology who must undertake accredited qualifications to obtain the certificate. To learn more about PRINCE2 (and how it compares to PMI's PMBOK Guide®), please review my presentation to ASTD in December of 2012, which can be found here: http://www.lessonslearned.info/ASTD/Project Management - PMI vs PRINCE2.pdf. Lessons learned in PRINCE2 is handled in the Lessons Log and Lessons Report. Lessons should be collected throughout the project and discussed at different STAGES of the project and at the end of the project. PRINCE2 for Dummies is a good reference for additional study. Kua, P. (2012), and The Retrospective Handbook: A Guide for Agile Teams. Vancouver, Canada: Leanpub. DMAIC (Define, Measure, Analyze, Improve and Control) refers to a data-driven improvement cycle to improve, optimize and stabilize an organization's processes. The DMAIC improvement cycle is the core process used for Six Sigma type projects. It is most common for lessons learned to come at the end of the Control cycle in DMAIC. It is also common for it to serve as an input to the Define process for future projects. Evaluating an organization's project management maturity level will help determine its current state and growth opportunities. 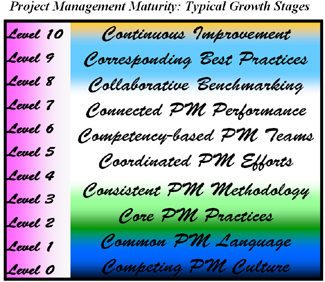 The figure below represents 10 typical growth stages organizations experience as they advance in project management. The overarching goal of PM is to fulfill requirements as specified in the project plan! A project manager is a qualified individual or entity (i.e., consulting firm) authorized by the sponsor or key stakeholder to manage the project. Qualified refers to relevant education, experience and or certification, i.e., Project Management Professional (PMP) certified by the Project Management Institute (PMI). The project manager serves as the lead on the project and may have reporting to him/her project team members, i.e., project coordinator responsible for creating schedules.